In the design of maritime vessels, the reduction of noise and vibration is of primary importance for the comfort and safety of passengers and crew, the reliable operation of sensitive instruments on research vessels and the acousticsignatureofmilitary vessels. One of the main sources of noise and vibration is the propeller. Shape-adaptive structures, which adapt their shape to changes in their operating conditions, have a number of applications including marine propellers. Previous studies of shape-adaptive propellers have concentrated on maximising the efficiency of the propeller, either in a ship's disturbed wake flow or at off-design conditions. 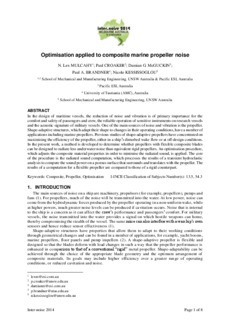 In the present work, a method is developed to determine whether propellers with flexible composite blades can be designed to radiate less underwater noise than equivalent rigid propellers. An optimisation procedure, which adjusts the composite material properties in order to minimise the radiated sound, is applied. The coreof the procedure is the radiated sound computation, which processes the results of a transient hydroelastic analysis to compute the sound power on a porous surface that surrounds and translates with the propeller. The results of a computation for a flexible propeller are compared to those of a rigid counterpart.